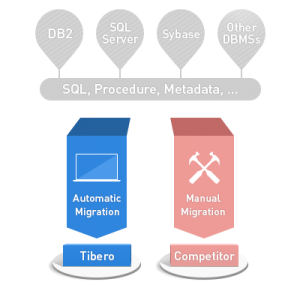 Tibero: A secure, fully compatible SQL RDBMS that scales easily and conforms to today’s cost optimized cloud architectures. On an enterprise basis, the expectations for performance and reliability are appropriately high. Nearly 150 customers have replaced Oracle with Tibero to run any number of applications, from transaction processing to decision support to big data analysis. But fast by itself isn’t enough. Enterprises need more. Needless to say, database availability is based on database reliability. TmaxSoft fully supports data clustering as the way to provide redundancy and failover. 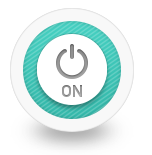 In fact, we are one of the few enterprise database vendors who offer a full range of reliability modes: active-active, active-standby, and clustering standby modes. Tibero’s clustering is architecturally similar to Oracle’s and provides easy transitioning. A common attack on databases is to replace true data with false data. Oracle handles this type of attack by digitally “signing” data so that any change is the data values will produce different “signatures” and would trigger a warning. So this simple class of attack should be neutralized. But in the TmaxSoft labs, our engineers used the same algorithm and key lengths as Oracle uses in their digital signatures , and they were able to compromise the digital signatures in under 90 minutes. We decided to take additional steps to protect data in Tibero. First, our digital key lengths are double Oracle’s length. This produced not a doubling of key complexity, but one exponentially larger. Our laboratory estimates indicate that using currently available compute technology, an intruder would need over 11 years to crack our digital signatures for just one dataset instance. But there is more. We also “digitally” sign the location of the data. 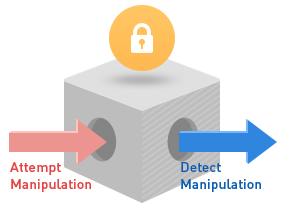 This means that one cannot take data and its correct “signature’ and relocated it elsewhere in the database, a common approach for injecting false data We are alone in the industry in building this type of security into our database. Yet there is even more. Most databases use encryption subroutines stored elsewhere on the server, accessing the subroutines as needed through agents, and providing a new point of attack. Tibero instead includes these routines within the database code itself, thereby eliminating completely this form of compromise. When you convert to Tibero, your Oracle, DB2, and other SQL based applications continue work unchanged and unmodified. 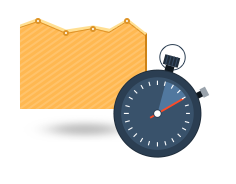 Further, Tibero is the only vendor to provide Oracle software clustering in addition to supporting Oracle commands, Oracle data types, and Oracle SQL extensions so that conversion from Oracle is especially straightforward; in most cases It takes an estimated 6 weeks. And because Tibero and Oracle share so much database environment commonality, your DBA might not notice the changeover. TmaxSoft has successfully completed nearly 140 Oracle to Tibero conversions worldwide, so we have validated and refined this conversion process over and over. We hear what the market is saying: enterprise class databases are significantly overpriced. So we decided to do something about it. Tibero’s license fee is priced at about half of Oracle’s. And we didn’t stop there. 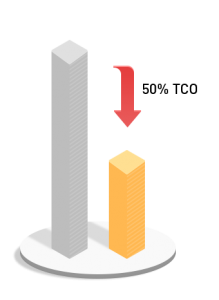 Most support costs are 25% of the higher license fee. Tibero support is just 20% of our lower license fee. Lower prices combined with quick transition make a compelling ROI. Call or email us today to find out what we can do for you and your enterprise.